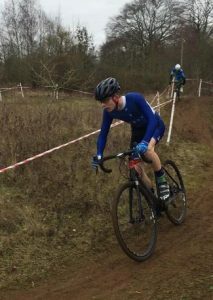 Due to there being no Western League race this weekend gone, we headed over to Dalton Barracks in Abingdon for Round 12 of the Wessex CX League. Signed on, number pinned, and spot selected in the pits Jense went off for his recce. The venue was a real multi surface affair with an even mix of gravel, grass, mud and tarmac. The weather was dry and clear. Due to the strong numbers in the Wessex League, every race is gridded, and Jenson found himself on the front row – always a good thing as the start is so important. The whistle sounded and they were off. The hammer had been dropped and the pace was fierce. Getting a fantastic start, Jense found himself at the head of the race on lap one. This was short lived though as he went into a sharp left a little too hot. The bike slipped and that was the only opportunity the chasing pack needed to slip through. Whilst the error was minor, it had pretty much sealed the fate of the race. From this point on, Jense was chasing from 4th not really knowing the form of the riders he was chasing down. It turned out that the three in front were tidy riders and fourth would be Jenson’s overall finishing position. 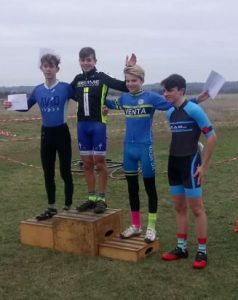 What we didn’t realise at the time though was that fourth overall was actually second in class as two of the riders in front were U14. All in all a fantastic morning with great weather, not too much mud and a chip waggon to boot. Even better when you take into consideration Jenson competed in his club 10 TT the day before and had crossed the line immediately behind his breakfast! Well done Jenson!